Marine debris teams were dispatched to assess the damage this week after a tiny, remote Hawaiian island was largely wiped off the map when a raging hurricane passed through, officials said. East Island was a low-lying island composed mainly of loose sand and gravel, and was home to threatened nesting green sea turtles and endangered Hawaiian monk seals. All but a couple of slivers of sand were erased from the already tiny island—about 400 feet (120 meters) wide and a half mile (0.8 kilometers long)— when Hurricane Walaka tore through earlier this month, satellite images from the US Fish and Wildlife Service showed. "East Island appears to be under water," said a statement from the Papahānaumokuakea Marine National Monument. The protected area is managed by the Department of Commerce, Department of the Interior, State of Hawaii and the Office of Hawaiian Affairs. Located about 500 miles (800 kilometers) northwest of Honolulu, East Island was the second largest islet in an atoll known as the French Frigate Shoals. "Oh my God, it's gone," he was quoted as saying by the local news outlet. "It's one more chink in the wall of the network of ecosystem diversity on this planet that is being dismantled." Hurricane Walaka peaked at a Category 5 storm, the most potent wind speed on the 1-5 Saffir-Simpson scale, and was the second strongest cyclone to ever to strike the Pacific region. 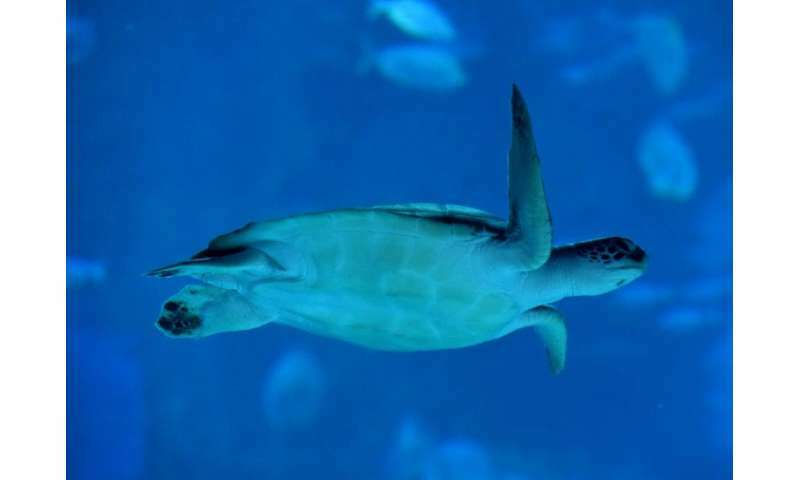 Charles Littnan, the director of the National Oceanic and Atmospheric Administration's protected species division, said about half the area's green sea turtle population nested at East Island. Fortunately, most of this season's juveniles made it to sea well before the storm it. As sea level rises due to climate change, "these small, sandy islets are going to really struggle to persist," he told the Huffington Post. "This event is confronting us with what the future could look like."